I am a very reluctant road cyclist. I like them as much as you do. Their behaviour is often questionable, and I've seen occasions where they place themselves in dangerous (but not illegal) positions. Cycling up hills in 70km zones on dual carriageways with blind corners, taking up an entire lane on Southern Cross Drive on a Sunday morning, using the road when there's no shoulder instead of the bike path right next to it. We've all seen it, a lot of you have probably seen red over it too. But do you honestly want a dead body on your conscience? That's not dramatic at all. When I was in high school, a policeman told us that a car is likely the most dangerous and deadly weapon we will possess in our adult lives. It's 2 tonnes of metal that's capable of doing 200 km/hr. Compare that to a bicycle, which is about 10kgs of aluminium, capable of going only as fast as the cyclist on it can manage with their legs, and with no mirrors, horns, accelerator, and a couple of bits of rubber for a brake. That's not a fair fight in anyone's book. So why are you so aggressive towards cyclists? They pose absolutely no threat to you. If you treat them with care, and as long as you're being aware behind the wheel, a cyclist will not injure you, or cause you to have an accident, or kill you. According to this report by the Australian Government, between 1991 and 2005, "655 cyclists were killed in road crashes". The report doesn't specify, but I highly doubt any of the motorists involved in those accidents were killed. I will ask you again. Why are you aggressive towards cyclists? Is it impatience? I can't think of any other reason. I may dislike cyclists, but I've never attacked them, swerved at them, thrown something at them, wound down my window and hurled abuse at them, honked at them, flashed my lights at them, intentionally driven close to them, or attempted to impede their progress. Yet I was a road cyclist for a mere 12 months, and every single one of those things happened to me, some more than once. 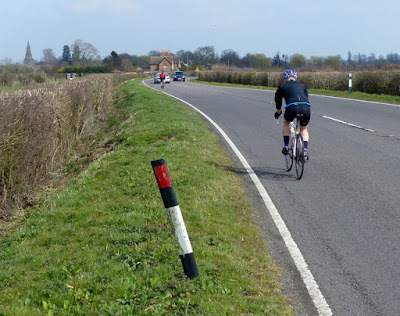 I started cycling because I couldn't run anymore, the dreaded ITB injury. There's a great cycleway near my house that runs for close to 30kms, which means 60km out and back. The problem is, I have to ride on the road for 3kms to get to it. 3kms both ways, that's 6km per trip. I was riding every second day for 12 months, so in total, I did about 1095km, probably what a serious road cyclist would notch up in a month. I was terrified, I hated every second of it. It felt wrong, I felt exposed and at risk. I installed mirrors on my bike so I could check my blind spot when riding around cars. I stuck to wide roads with big shoulders and speed limits under 70km/hr. And yet still I copped it. At least 30 separate incidents of road rage, ranging from people winding down their window to unleash expletives as they drove past, to a woman clipping my back wheel at a round-a-bout then swerving at me as she passed. One day really exemplified the difference between cyclists and motorists. I was almost home, I was exhausted, and as I approached a round-a-bout, I completely misjudged a gap in the traffic and didn't give way to a car turning right coming from the opposite direction. I looked up, and the driver saw me, and easily had enough time to stop and let me pass. Which she did. I put my hand up in apology and carried on through the round-a-bout. But she had no intention of letting me pass. She did a full loop of the round-a-bout, and flew up behind me flashing her lights. She almost clipped my back wheel. There were parked cars on the left-hand hand side, so I pulled over behind one to let her pass. She came up beside me, stopped, wound down her window, and yelled at me across her young daughter (I am terrible with ages, but I'd guess between 5 and 10 years old). All manner of expletives, words I wouldn't have even thought to put together. I kind of sat there and let her go, after all, I was in the wrong. She eventually drove off, but I was incredibly shaken. If she had hit my back wheel I'd have been thrown into the parked car in front of me. That same day, not 2 hours later, I was in the car with my friend. She was chatting about something passionately and didn't give way to her right at a round-a-bout, just as I had earlier. The driver stopped and let her pass. She waved a sorry, the driver waved back, and off we went. Sure, you might say they're different people, you have to expect different results. But when was the last time someone chased you, pulled up beside you, and abused you after you failed to give way to them? Now ask a cyclist the same question. I want to scare you. You may very well kill someone one day if you act on your frustration with cyclists. Cyclists do the wrong thing, as do motorists. We all make mistakes, we all put ourselves in compromising positions at times. It might take you 5 minutes longer, waiting for the right time to overtake a cyclist. What is 5 minutes? What is 15 minutes? Would you rather be late, or be sitting in a courtroom, with death or serious injury on your conscience?